1 What Does Termite Larvae Look Like? 2 Do Termites Live in The Ground? 10 How Much Damage Can House Termites Do? What do you know about the termites? Perhaps you’ve heard that in Africa these insects build termite mounds, resembling entire cities. Have you ever thought that termites in house could bring it down? To find out how to get rid of termites and select an appropriate home remedy for termites, you need to learn more about what termites prefer and how they live. 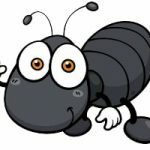 Often called ants, termites actually belong to the cockroach insects family. It is an ancient order of insects, whose fossils date to the Paleozoic era. 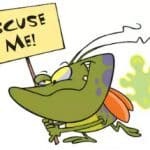 It is difficult to call them pests because they cause no damage to the ecosystem. Sometimes you can find termites in house, but usually, you can see them outdoors. Wood termite does not harm living trees and only recycle rotten wood and dry foliage, as well as participate in soil formation. Besides, the termites in trees serve as food for many animals, birds, and in some African and South American countries – as a delicacy for humans. What Does Termite Larvae Look Like? The appearance of termite larvae is similar to that of small white ants, ranging in size from 0.5 cm to 1.5 cm. Because termites live in the burrows all their life, their exoskeleton plates are soft and contain no pigments. The termite larvae appearance depends on which caste it belongs to: worker termites are completely blind, “soldiers” have highly developed powerful jaws they use to protect their colony. Once a year during the spring, termite larvae capable of reproduction (also referred to as alate) grow wings, so they could leave and create new colonies. In the tropics, swarming termites are an excellent food source for birds, animals, and amphibians. The termite swarms are so numerous that after they shed their wings, the earth is covered with a layer of these discarded elements. Do Termites Live in The Ground? As we already mentioned, termite larvae live in underground burrows all its life. These insects can be found on all continents except Antarctica. 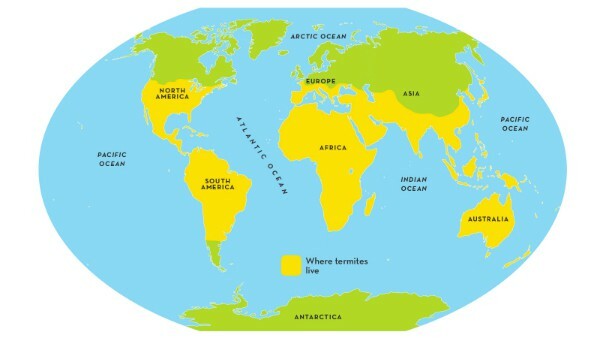 However, most of the species are found in tropics, subtropics, and sometimes in warm temperate regions. There are more than 2000 different termite species, some of them live only in certain places, are protected by the government and are on the IUCN Red List. There are only 10 species of termites in Europe, while Africa has more than 1,000. The northernmost areas where termites can be found are in the south of Canada, in central France, Korea, and Central Asia. Mediterranean termites, which do not cause any severe damage, live in temperate climates of the Mediterranean Sea region. Wood termites colonies live and develop similarly to colonies of ants and bees. There is a strict hierarchy among the insects: workers, soldiers, and the reproductive caste. At the heart of the colony is the termite queen, who is responsible for egg production. Termite larvae can lay over a thousand eggs in a single day. There are species of termites in Africa whose queen lays an egg every 2-3 seconds. This amounts to 30-35 thousand eggs a day. The queen’s size reaches 10 cm, which is several times the size of a regular termite. She can not move by herself, and if necessary she is moved to a new location by several dozens of worker termites. The mound itself has from several hundred up to several million members. It becomes clear that the arrival of these insects will soon lead to their catastrophically rapid reproduction. 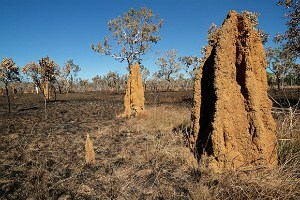 You can find termite mounds in yard that are like entire cities, with a height of about 2-3 meters. Termites build walls so strong they cannot be broken even with crowbars. And there are many passages and tunnels constructed underground, spanning dozens of meters. 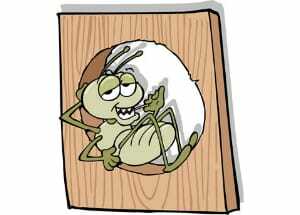 The main source of food for termites is cellulose contained in the wood. These insects are able to consume dry leaves, tree stumps, and paper. This is why in South American cities you can rarely find books over 50 years of age — they are all damaged by wood termites. However, these insects rarely touch living trees. 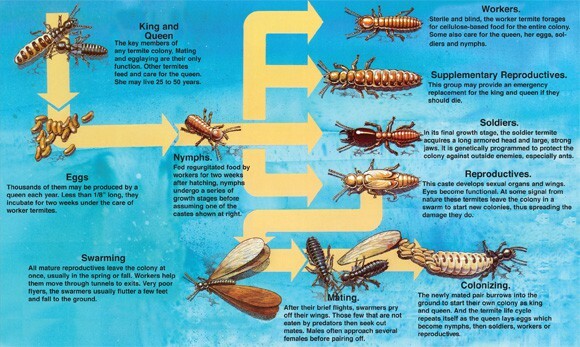 Therefore, wood termites cause no damage to the ecosystem. 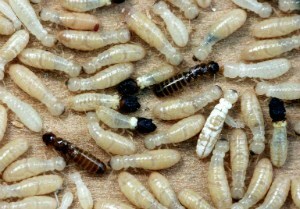 Some species of termites can eat linen, wool, and cotton fabrics, as well as leather products, although they do so rarely and unenthusiastically. The most interesting part is that only the workers actually feed themselves. They dig tunnels in wood, partially digest the cellulose and feed termite soldiers and the queen with digested substance. As a result, termites have a system of waste-less food recycling. Termites inside house can be found in cellars with wooden beams, in wooden furniture, and in firewood. The worst part is that it is almost impossible to detect them immediately, so the process of getting rid of termites is postponed indeterminately. Wood termites can stay hidden and live in wooden structures without revealing their presence for several years. These structures may look undamaged, but inside they will be hollowed out by termite tunnels. And under any stress, the damaged structures may collapse, even before you have an intention of getting rid of termites. The lifespan of termites depends on their species and their caste. Worker termites live for 1-2 years. Meanwhile, under the right conditions, the queen can live for about 10 years. During this time, the colony’s numbers are increased hundred times over, and new colonies may emerge from it. This happens when colony members capable of reproduction develop wings and fly out of their mound. After starting a new colony and beginning to mate, the termites shed their wings, which never grow back. Over a couple of years, termites can damage or completely destroy house’s wooden bearing structures. 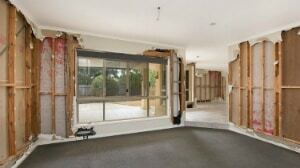 Getting rid of termites is a question of your house safety. DIY termite treatment is a necessary measure. By the time the house owner discovers the presence of termites, most of the wooden structures will be completely destroyed by house termites and DIY termite treatment will be unnecessary. That’s why it’s very important to discover the insects’ presence as soon as possible in order to start getting rid of termites immediately. What should you do to perform an appropriate DIY termite treatment? 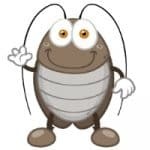 Look for the signs of house termites infestation: Even if you haven’t found any signs of the insects the first time, it doesn’t mean they aren’t there. There may be indirect signs of their presence: sagging floors, small holes in wooden elements. These signs should make you think about getting rid of termites directly. Inspect the basement: Take a flashlight and a screwdriver and check the integrity of the wooden supports and beams. Tap on the wood. If it sounds hollow and some dust (which is apparently termite dust) pours out of it, that means it’s already hollowed out by termite tunnels. Another telltale sign is if you can easily pierce the wood with a screwdriver. It’s the right signal to start getting rid of termites urgently. Traces of Feces: House termites feces look like small granules colored slightly darker than wood. You can find them under wooden objects. Find the house termites nest: Found in the ground or inside wooden structures a branching tunnel system will lead to the nest. Determine the type: subterranean or drywood. Subterranean termites live underground, inside woodpiles, wood and manure heaps, while drywood termites live in wood exclusively. Subterranean and drywood termites treatment are performed in different ways, so it’s important to determine exactly what type has infested your home. If you discover signs of termite presence, you should start with termite treatment immediately. 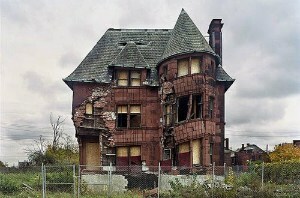 Most likely, they have moved in a long time ago and caused some serious damage. Do it yourself termite treatment gives no guarantee of complete termites extermination. 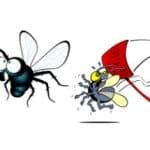 It all depends on the severity of infestation, the skill of the person conducting the DIY termite treatment, and on the termite killer chemicals used. The best way to get rid of termites is to use termite treatment chemicals. They are selected depending on how they act and which is more suitable for the situation. Liquid insecticide fipronil: the most common of the termite treatment chemicals. This is an expensive chemical. It is mixed with water according to the instructions and then used to treat wooden structures or fill the moat around the house foundation. Soaking in the ground, this kind of termite treatment chemicals repels house termites and creates a barrier against pests. Fipronil is the main ingredient of Termidor SC Termiticide. Imidacloprid Granules is a popular and easy-to-use termite killer, efficient in the process of getting rid of termites. You can spread them around wooden structures or the foundation. 4 kg of chemicals is enough for a 60-meter strip around the property. This chemical termite treatment is two times cheaper than the liquid one. 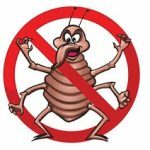 There are many imidacloprid-based products on the market that directly answers the question how to get rid of termites. Termidor fipronil foam is a slow-acting of termite treatment chemicals. The foam is pumped into hard to reach places through a long nozzle of a pressurized can, sealing the entrances to the termite nest in house. This one of termite treatment chemicals causes a paralyzing effect on house termites after 8-10 hours. 80% of users prefer to use foam because of how convenient it is, as well as because of it’s long-lasting effect on pests. It gives a sure result in the getting rid of termites mission. Spray can with a nozzle: a fast-acting termite killer agent based on permethrin and tetramethrin. This kind of termite treatment chemicals is effective for up to 4 weeks. It is the best termite killer spray nebulized on wooden surfaces. This is the cheapest chemical on this list. Terro Carpenter Ant & Termite Killer has a special formula for eliminating wood-eating insects. Besides termites, it kills carpenter bees, wood wasps, and beetles. There’s a precision tube that allows you to spray it into any crack and crevice there is. It kills on contact and provides long-time control of your termite infestation for up to four months. Can be used indoors and outdoors. Terro active formula is based Deltamethrin, a harmful ingredient killing termites on the first touch. If you want to reach the further spots of the wood where the insects hide, drill small holes in every 10 inches of the structure and spray the product deep into the holes and tunnels with the nozzle tip. If you need to scatter Terro across a large area as a means for infestation prevention and control, use wide spraying instead. The spray doesn’t leave any stains or unpleasant odors, but it may be dangerous to your health and the health of your pets and children. Please leave the room after spraying it and don’t re-enter until the substance is dry. It is also recommended to keep Terro substance away from food. in case of severe infestation additional means may be needed. Hexaflumuron and diflubenzuron termite baits sterilize the queen. This termite killer is very effective, but the result takes long. 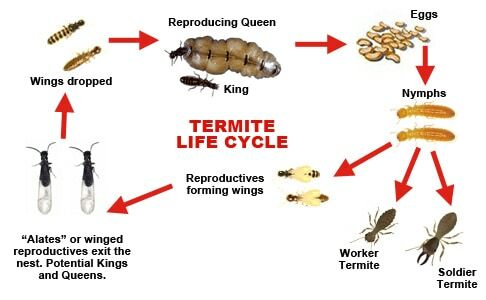 Over time, the queen stops laying eggs, and new house termites stop being born. It must be applied 2 times a year in conjunction with the other means of termites extermination. Termite station is probably the most professional and efficient tool for reducing termite infestation in your house. BASF makes ammunition for professional pest controllers, and this bait station requires basic knowledge of what’s what in pest extermination. It works as a bait system, a piece of extermination equipment, and a monitoring tool. Install them close (2 to 4 feet) to your house structures or other places that attract termites. The first installation is made with attractive wooden bait only so that you could monitor the stations for termite infestation every three months. If one of the stations indicates an infestation, replace the monitor cartridge with the bait+poison cartridge. Among this system components you will find the station with minimalistic design; termite inspection cartridge that contains especially created Puri-Cell monitoring matrix; termite monitoring base of preferred food species that easily allow termite access, this is the point where termites enter the station; concrete bait station that may be used when you need to monitor and exterminate termites where soil is inaccessible; quick-lock cap that makes openings and lockings easy; the spider access tool which is a unique tool that opens the stations. You can mix and match the elements of the BASF system as you like to make up the very order you need. Handling the stations with so many details may seem confusing but the paper instruction provided and even more thorough instructions on the website you won’t get lost. can be used within soil or house structures. installation may require some working skills. Boric acid: an effective substance that is included in many termite treatment chemicals. It destroys termites’ nervous system, dehydrates the pests and leads to their death. Boric acid is a termite killer applied to wooden surfaces, spread across the garden, near the house, and around the basement. The use of termite pesticides is dangerous to other people and pets. 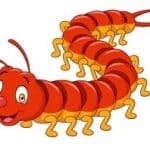 During termites extermination process it’s mandatory for homeowners, their children and their pets to leave the house. All termite treatment chemicals must be used according to the instructions and adhering to all safety measures. For those who do not want to deal with toxic termite treatment chemicals, organic substances or repellent scents can be employed. Diatomaceous earth (dust and powder). This natural termite killer cuts into the termites’ chitinous cover and penetrates it, causing their death. The termite dust is safe for humans, as long as you don’t inhale it. It is necessary to use protective mask and safety goggles while applying this termite treatment agent. The major disadvantage of diatomaceous earth is that it works only in dry wood. It stops being effective if there is even the slightest moisture. Cardboard trap. To make a DIY termite killer wet the two cardboards, place them on top of one another, and put it next to the supposed house termites habitat. Since these insects feed on cellulose, they will be attracted to cardboard, and they will fill the space between the cardboard sheets. The cardboard must then be taken out and burned. This manipulation with a DIY termite killer can be repeated several times. However, it is not an effective way of getting rid of termites, because house termites reproduce very quickly and not all will fall into the trap. Complex actions must be taken, employing additional measures to kill termites. Sunlight is a natural termite killer. So you can use heat in the process of getting rid of termites. If wooden furniture is infested, place it in the direct sunlight for 2-3 days and house termites will die. They also can not survive the heat of over 50°C for 30 minutes or 1-2 days of freezing. However, such conditions are difficult to achieve for basements or large wooden structures. A mixture of naphthalene, creosote, tar, turpentine, and kerosene can ensure the termites extermination in a small area. But such termite killer mixtures can be used only in non-residential premises and structures. Otherwise, the smell of this termite killer will ruin all your household stuff. As practice shows, there’s only 4% chance of successful DIY termite extermination methods use. 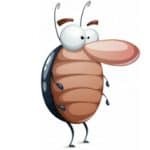 This means that time spent trying to find a useful termite killer will lead to their even greater multiplication and even more property damage. This difficult task of getting rid of termites is better left to professionals. But in this, too, some caution is necessary. 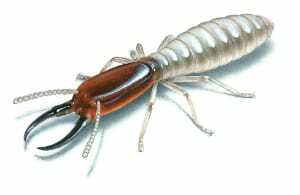 There are lots of unscrupulous or unskilled “professionals” on the termite extermination market. 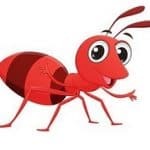 Before applying professional termite treatment services, you should familiarize yourself with the services offered by the company, check their qualification certificates, read the reviews. You should pay special attention to quality warranty, free treatment result inspections scheduled after a specific time period, and free re-treatment in case of unsatisfactory results of the termite extermination. Well-established and trustworthy termite extermination companies issue a written warranty for 2 years. If you get no such warranties, this could mean the termite treatment company you’re dealing with may be somewhat shady. 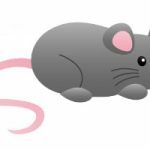 Pest control should be carried only out by certified pest control operators, who have the government permission for it. During home termite treatment process it’s mandatory for homeowners and their pets to leave the house for a week. The struggle against these pests is long, difficult and expensive. Therefore, it is much cheaper and easier to conduct do it yourself termite prevention, take all necessary precautions during house construction, follow a simple set of rules and inspect wooden structures regularly. The most effective measure for termite prevention is conducted during the construction of a wooden house or wooden structures. You need to treat all wooden parts with a 0.1% solution of permethrin. This way, you will perform a good termite prevention and ensure that pests will never approach the building. If this wasn’t done initially, you can treat all wooden structures in the basement, as well as outside and around the house after the construction is finished. Keep the house and basement dry. Check for leaking pipes or a clogged gutter. When painting or constructing, add a 0.1% solution of permethrin to the varnish or paint. This concentration is safe for humans but repels house termites. Keep firewood away from the house. Seal the cracks in wooden structures with cement mortar. Seal all cracks and crevices in the house, install mosquito nets on basement ventilation. Check all wooden supports and beams for the signs of house termites. Following these simple steps, you can prevent termites from getting inside your house, or detect them as early as possible. How Much Damage Can House Termites Do? The most dangerous thing about house termites is that they are almost impossible to detect at an early stage of infestation. Often called hidden invaders, they can eat away at your home for years, and you’ll never even know. 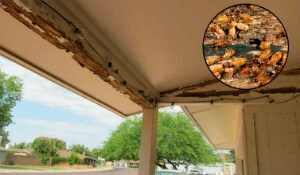 Termites hollow out wooden structures and beams from inside out, leaving them with no visible damage on the outside. Their traces are not easy to spot, either. It takes house termites 2-3 years to completely devastate the house in which you were going to live for several decades. In different countries, these insects cause billions of dollars worth of property damage each year. 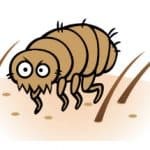 If you don’t refer to home termite control, take no steps of termite prevention, do nothing to protect your home in time or use an effective termite killer once you detected pests then one day it may become not just uninhabitable, but also dangerous. The beams consumed by house termites will become weak and may collapse at any moment, causing irreparable damage. As the saying goes, a man’s home is his castle. And for this castle to remain impregnable for a long time, it is imperative to take immediate measures to combat the hidden enemy — house termites. Thanks for giving me historical facts about termites. It’s interesting they are are very ancient since their fossils even date back from the Paleozoic era. The ad you’ve said they can damage or even destroy a house. My sister moved to an old house that’s termite infested. I’ll let her read your article so that she’ll know where to find them in case she hire a pest control service. Can termites continue to grow the colony or stay on once you kill the queen? Thanks for the wonderful post about how to get rid of termites! I hate them!